1679 Thunder Bay Island described by Louis Hennepin during journey with LaSalle on the Griffin. 1830 Appropriation for the first lighthouse on Thunder Bay Island. 1831 Construction begins. First tower collapses during a storm. 1832 Construction completed. Jesse Muncy appointed as first lighthouse keeper. 1835 William Cullings first fisherman. 1847 New lighthouse keeper dwelling constructed. 1850 Wreck of the side-wheel steamer, New Orleans, near Sugar Island. 1857 Lighthouse rebuilt and equipped with Fresnel lens. 1858 Fog signal bell installed. 1859 John Paxton purchases Sugar Island and moves fishery operation there. 1860 First assistant lighthouse keeper position established. 1865 Pewabic sinks with valuable copper cargo after being rammed by steamer Meteor. One hundred twenty-five killed. Wreck located in 1917. 1868 Attached lighthouse keeper’s quarters constructed. 1871-72 Steam fog whistle and building constructed. 1874 Life Saving Station appropriation approved for Thunder Bay Island. 1876 Life Saving Station opens under Captain Isaac Matthews. 1877 John Persons appointed captain of Life Saving Station. 1884 Storm house added to keeper’s quarters. Tramway constructed for delivery of coal to fog signal building. 1889 Storm damages station and destroys tramway. 1892 New landing dock built for lighthouse. 1894 Second fog signal purchased and installed. 1895 Telephone service installed between Alpena, Thunder Bay Island, Middle Island, and North Point. 1901 Assistant lighthouse keeper’s quarters remodeled. 1907 Brick fog signal building constructed. Cement walks installed at lighthouse, wooden cistern replaced with brick cistern. Second Assistant Lighthouse Keeper position established. 1909 Life Saving Station begins using 34-foot powerboat. 1913 Lamp converted from kerosene to oil vapor fuel. 1914 Life Saving Service merged into US Coast Guard. 1916 Old fog signal building remodeled into residence for Second Assistant Lighthouse Keeper and family. 1919 Permission granted to US Navy to occupy areas at Life Saving Station. 1920 Permission granted to US Navy to occupy areas at lighthouse complex. Radio compass station installed near lighthouse. 1921 Type C diaphone fog signal installed. 1926 Radio beacon antenna installed between two 80-foot towers near fog signal building. 1927 Radio station building erected near fog signal building. Navy occupation of Life Saving Station cancelled. 1930 New Coast Guard station built. 1932 Type F diaphone fog signal installed. Addition to Second Assistant Lighthouse Keeper’s dwelling. Addition to fog signal building for fuel storage. 1938 Cement coating applied over brick of lighthouse. 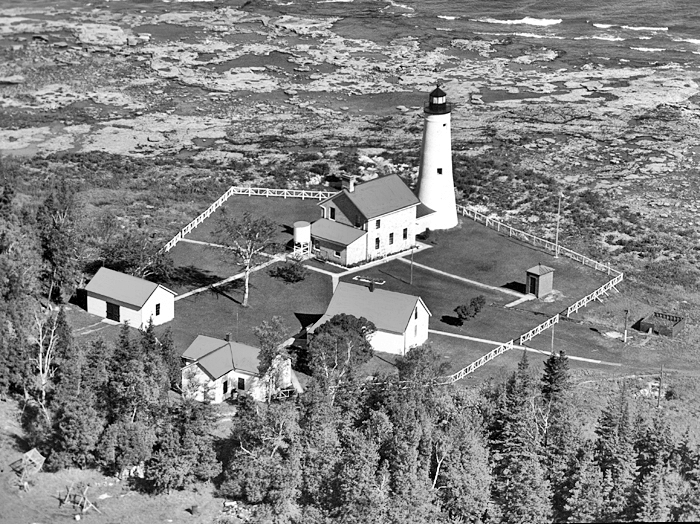 1939 Lighthouse Service merged into US Coast Guard. 1944 Feasibility study for relocation of US Coast Guard station to North Point. 1962 Coast Guard burns down the old Life-Saving and barracks buildings. 1980 Lighthouse automated and station closed. 1984 Lighthouse designated a historic site in the National Register of Historic Places. 1990 Environmental study of Thunder Bay Island by Batelle Corporation. 1996 Archaeological study by Michigan State University students. 1997 Portions of island transferred to Thunder Bay Island Preservation Society under a ten-year lease. 2000 Thunder Bay designated National Marine Sanctuary. 2001 Awarded Clean Water Initiative grant via Alpena Township for repairs to light tower and chimney. 2003 Coast Guards lease extended until 2027. Grant extended until July 2004. 2004 Began engineering phase of the Clean Water Initiative grant. Partnered with Alpena Township to gain ownership of the southern portion of the island. 2004 Publication of historian Steve Tongue’s book, “Lanterns & Lifeboats: A History of Thunder Bay Island”. 2005 Applied and received a grant from the Michigan Lighthouse Assistance Program for standing seam metal roof on the Keeper's Quarters. 2006 Roof project is completed by Meridian Contracting out of Alpena. 2007 Added new steel door to the north side of Fog Signal Building. 2009 Began a room restoration in the Keeper's Quarters. 2010 Completed the "Rehkopf Room" in the Keeper's. 2011 Began the process of partnering with Alpena Township to gain ownership of the southern portion of the island. 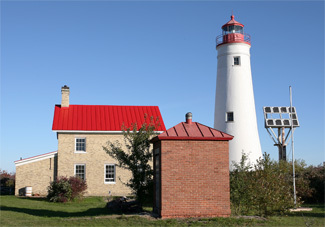 2012 Included Thunder Bay Island Light Station in the updated Alpena Township Recreation Plan. 2013 Installed a portion of the historic tramway and received a CFNEM grant for an interpretative sign for visitors to understand the importance of the tramway to island personnel. 2014 The Bureau Of Land Management presents a land Patent to Alpena Township for 43.08 acres to be used as a day-use park. 2015 Applied and received a grant from CFNEM for historic sign posts for the transfer sign presented by the BLM at the transfer ceremony. 2016 Received permission from SHPO to remove a portion of the bricked over passage to the tower to help create ventilation. 2017 Installed the transfer sign out on the island, also installed a cedar kiosk over the tramway interpretative sign. Hosted many government visitors out to the island to begin the future planning for public access.